Indeed, Pandora’s “box” was, as the Ancient Greek records, actually a pithos, a kind of jar. This word jar has become something like a Pandora’s jar for my writing of late–of course, instead of releasing all sorts of evil into the world, the word has been unleashing all sorts of surprising etymological connections onto my blog. See, in looking up word origins in etymological dictionaries, sometimes one entry is positioned next to another word that excites my curiosity. When consulting Ernest Weekley on ajar in An Etymological Dictionary of Modern English, I came across the entry right below it, akimbo. I rely on online resources quite a bit for, well, everything I do, but there is something to be said about stumbling upon words simply by flipping through a dictionary during the hunt. And akimbo, it may also turn out, might just deal with liquid-containing vessels like a jar. Akimbo–a posture formed by placing the hands on the hips with elbows bent outwards–is an unusual word whose origins are quite mysterious. The Oxford English Dictionary (OED) first records akimbo in the 1400s, taking the late Middle English form of in kenebowe. The first element, in, was reduced to a, much as we saw in ajar. Concerning kenebowe, however, etymologists puts their arms not akimbo but a-shrug. In bowe, some see a usage of bow, something “bent” or “curved,” as a handle. This is the same bow we see in the one of the key features of akimbo, the elbow. In kene, some etymologists seen keen, “sharp.” So, in keen bow, we get “at a sharp angle,” but the evidence for keen used in this way back then is lacking. Anatoly Liberman dispatches with several additional theories: that akimbo comes from the Italian a sghembo, “awry, “aslope”; Gaelic cam “bent, crooked”; and a Scandinavian word for a “hillock” or “bundle of hay,” as exemplified in the Icelandic kimbill. We may never be at ease when it comes to the ultimate origin of akimbo, and etymology is no easy business. But one thing’s for sure: the connections keep coming. 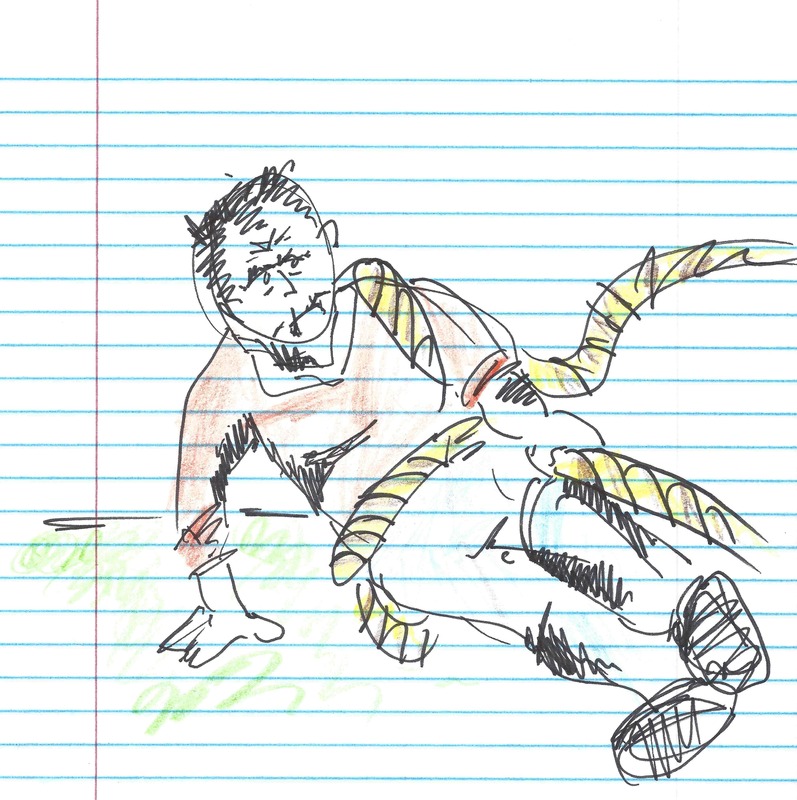 Jar leads us to akimbo, and akimbo leads us to…ease? We’ll take the lid off of ease next post. Last post, I pointed you to my Strong Language piece on swear jars. Now, what might be pickling in this short, simple word jar? Quite the etymological surprise, if you ask me. According to the Oxford English Dictionary (OED), jar joins English in the 16th century. The OED records jar in 1598 in a reference to the Italian giara, glossed as iarre and defined as a liquid measure. (The letter j is late to the spelling scene.) While this citation is Italian, the word is likely from the French jarre or Spanish jarro. These, in turn, are taken off the shelf of…Arabic. 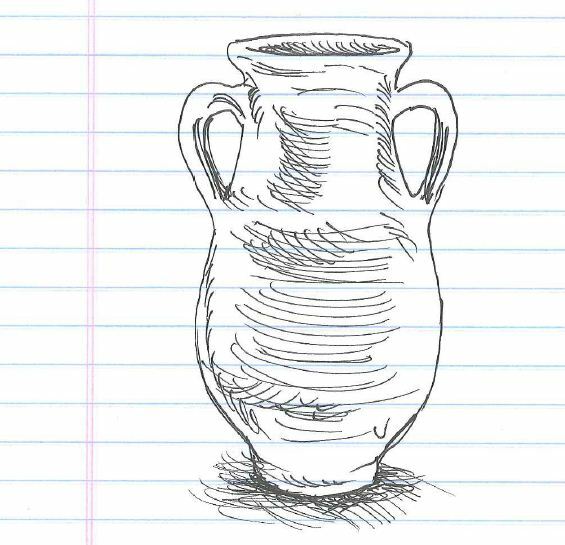 Etymologists trace this simple jar all the way back to the ancient technology of the Arabic jarrah, which the OED defines as an “earthen water-vessel.” Other definitions add that the jarrah was large. Jar, as in jarring, is said to be of imitative origin. Ajar can refer to disharmony or, more commonly, a door slightly open. The latter is documented in Scottish dialects for on char. The former element was reduced to a, and the latter word comes from the Old English cęrr, a “turn.” So, a door ajar is a door “on the turn.” Strong Language contributor and co-founder James Harbeck gives us a further ‘taste’ of ajar. Speaking of taste, jars can hold cookies, jam, tips, beans, or masons. That might just be a jarhead thing to believe, as a mason jar was once a Mason jar, named for the inventor who patented this now-hipster staple in 1858. Their screw-on lids are one of the real secrets to their success, as the New York Times observes. And tall and a of port in air. 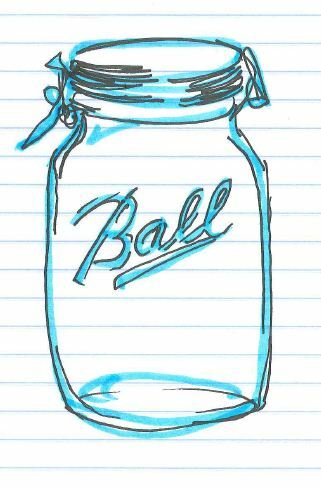 Words–and the linguistic imagination–can be so much like Stevens’ jar. *Stevens, Wallace. 2000. “Anecdote of the Jar.” Anthology of Modern Poetry. Ed. Cary Nelson. New York: Oxford University Press, 2000. 130. Print. Perhaps you are observing Lent. Perhaps your observance involves a sacrifice. Perhaps that sacrifice is giving up swearing. Maybe you are enforcing that sacrifice with a swear jar. And maybe you contributed quite the funds to your swear jar after viewing last Sunday’s Academy Awards. If so, you definitely don’t want to miss my latest post on Strong Language, “‘Til the swear jar’s full”: Penances, pennies, and profanities.” Be sure to scope out the comments, as some commenters have offered some great anecdotes about their own swear jars. As always, be advised that Strong Language does contain strong language. And if you are new to Mashed Radish, welcome, or if you just need some warmer temperatures this winter, check out one of my very early posts on spring, which we used to call Lent. A beagle named Miss P took home this year’s Best in Show at the Westminster Kennel Club Show. 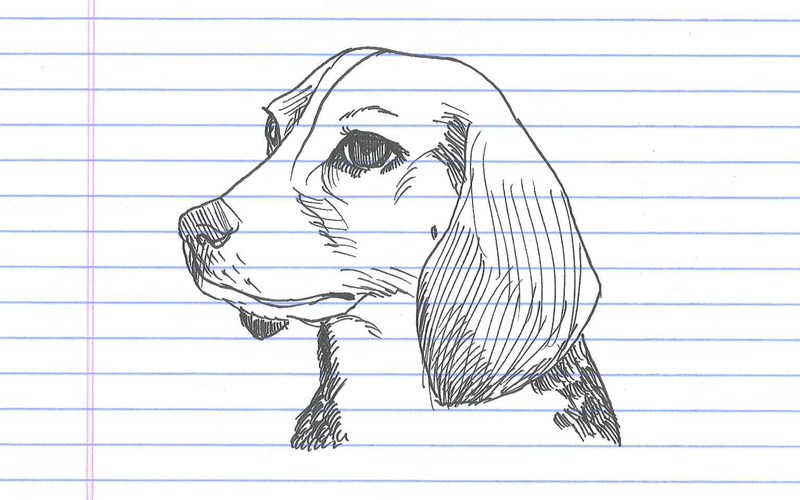 Beagles, of course, are known for their noses–and their barks, which may well have given them their very name. The Oxford English Dictionary first attests beagle around 1475 as begle. While they can’t quite track down its ultimate origin, etymologists do have a scent: the French bégueule, among other forms documented, joining béer (“to gape”) and gueule (“throat”), from an Old French word for a “noisy person.” The records don’t show the usage applied to the canine, but the meaning may have been transferred from man to mutt, “the beagle being noted for its loud, musical bark,” as Ernest Weekley puts it. Related to béer is bayer, giving English one sense of bay, which the OED poetically glosses as the “chorus of barking raised by hounds in immediate conflict with a hunted animal.” The bark of bay is an ancient one and probably of imitative origin, like bow-wow. Connected to gueule is gullet, rooted in the Latin gula, “throat.” For this, the American Heritage Dictionary of Indo-European Roots hunts down *gʷele-, “to swallow,” down whose hatch jowl, glut, and glutton also go. Also possibly related is gullible, from an old sense of gull meaning a “dupe,” who will swallow just about anything–an apt description for many beagles I’ve known. Now, the HMS Beagle was a very different kind of bark–gag–but Darwin’s legendary ship was the second of eight ships named for this dog breed. And Miss P was only the second beagle to take Westminster’s top prize. It seems this this beagle can lead us down quite the rabbit holes. Before observing the fasts and penances of Lent, today many Catholics (and other revelers) will celebrate with the feasts and parties of Mardi Gras. As you probably well know, Mardi Gras is French for “Fat Tuesday,” but why do the French call Mardi Gras Mardi Gras? 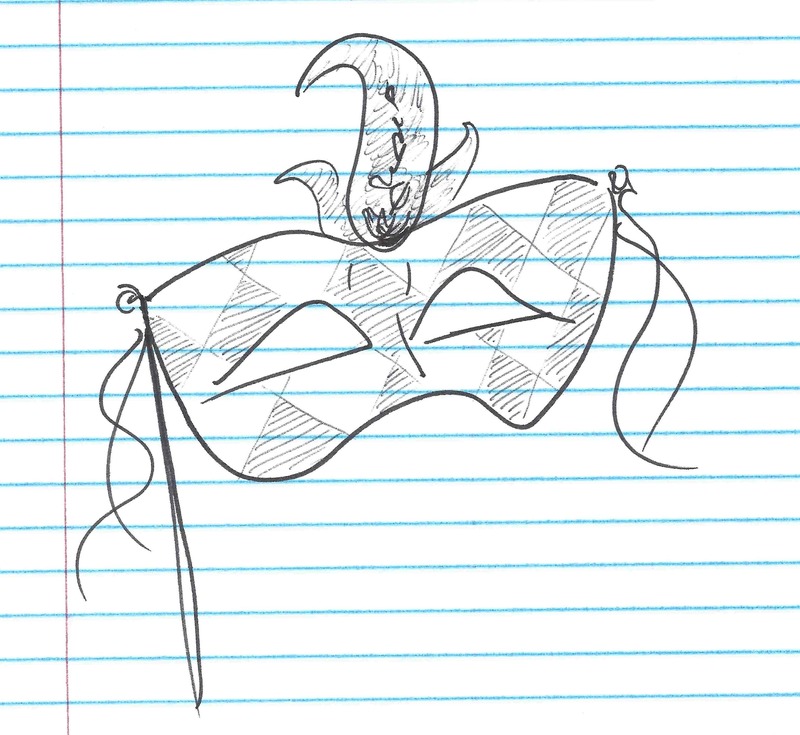 “Mardi Gras.” Doodle by me. The French name for “Tuesday” and with an earlier form of marsdi, mardi is derived from the Latin diēs Martis, “Day of Mars,” the Roman god of war. In fact, the English Tuesday is a loan translation of this very diēs Martis, as Germanic tribes modeled their names for the days of the week on the Romans’. Tuesday comes from the Old English Tiwesdæg, or “Day of Tiw,” a Germanic god of war considered an equivalent to Mars. But the Romans weren’t original, for Martis diēs is itself adopted from the Greek’s own ἡμέρα Ἄρεος (hemera Areos), or “Day of Ares,” the Greek war god. Based on various astrological considerations and astronomical calculations, these Greco-Roman days of the week were named after planets, which were named after gods, though the particular seven-day concept is rooted in Jewish–and yet more ancient–traditions. Etymologists can’t quite marshal up a secure origin for Mars–few origins ever are secure, really–but many posit roots in the name of an ancient Italic deity. Diēs, however, is reconstructed in *dyeu-, the Proto-Indo-European root for “to shine”–which, in one of those scintillating surprises of word histories, ultimately bestowed Tiw, Zeus, Jupiter, and yet other deities their very names. Maybe some celebrants eat foie gras on Mardi Gras. The second element of both noun phrases are the same. The French gras is from the Latin crassus, which could mean “thick,” “solid,” “stout,” or just plain “fat,” as well “dense” not only in composition but also in intelligence. Crassus yielded Late Latin forms referring to “animal fat,” hence the French gras and, eventually, the English grease. Crass is also derived from crassus. Fat can be quite a crass term and foie gras a crass practice, so, whether you are keeping up on your New Year’s resolution to lose a few pounds or fighting against animal cruelty, perhaps you will carnival on this Carnival. Contrary to popular etymology, carnival is not from the Latin carnem valē or “farewell, flesh” but believed to be from carnem levāre, “to remove flesh,” referring to that Lenten sacrifice of meat. An intermediary Italian form, carnelevale, helps explain the the evolution and later confusion. From Latin’s levāre (which could also mean to “raise,” among other meanings) we also get levitate, lever, levy, levee, the Levant, and levity. If and whether you are masked, costumed, or beaded on this Mardi Gras, I hope your Carnival festivities are full of levity–and I hope your feasts ultimately weigh you down. In American media news this week, anchors sank. Brian Williams’ six-month suspension from NBC just might sink this anchorman’s career, while Jon Stewart’s retirement from anchoring The Daily Show for over 15 years sank the hearts of his many fans. But why do we call newspeople anchors? Amnesia, disguises, and mistaken identities? No, these are not the plot twists of a blockbuster thriller or bestselling page-turner. They are the story of the word culprit. At first glance, the origin of culprit looks simple enough. Mea culpa, culpable, exculpate, and the more obscure inculpate: these words come from the Latin culpa, “fault” or “blame.” One would suspect that culprit is the same, yet we should never be so presumptuous when it comes to English etymology. Culprit is indeed connected to Latin’s culpa, but it just can’t quite keep its story straight. Read “The curious case of culprit” in full. The recent outbreak of measles in the United States is incredible for a lot of reasons, especially since the country declared the disease officially eliminated here in 2000. But the word measles–and the disease, to be sure–has been around for a long time. “Measles.” Doodle by @andrescalo. Sorry, Canada. The first ‘case’ of measles in the English language was documented as early as 1325, where, in the form of maseles, it glosses a French term for the same, according to the Oxford English Dictionary (OED). The disease, of course, is associated with its rash of red spots. These spots lent measles as a term for execresences on trees in the 1600s and blemishes on photographs or paper in the late 1800s. And it’s these very spots which may be symptoms, if you will, of its origin. The word measles is Germanic in origin, with etymologists citing immediate origins in either Middle Dutch (masel) or Middle Low German (maselen) words for blood-blisters and sickly skin spots or scars. But etymologically, measles is not all bad. The word and its Germanic sources are also associated with some rather lovely things: a mazer, a drinking vessel typically made of out maple or out of the knot of a maple tree. 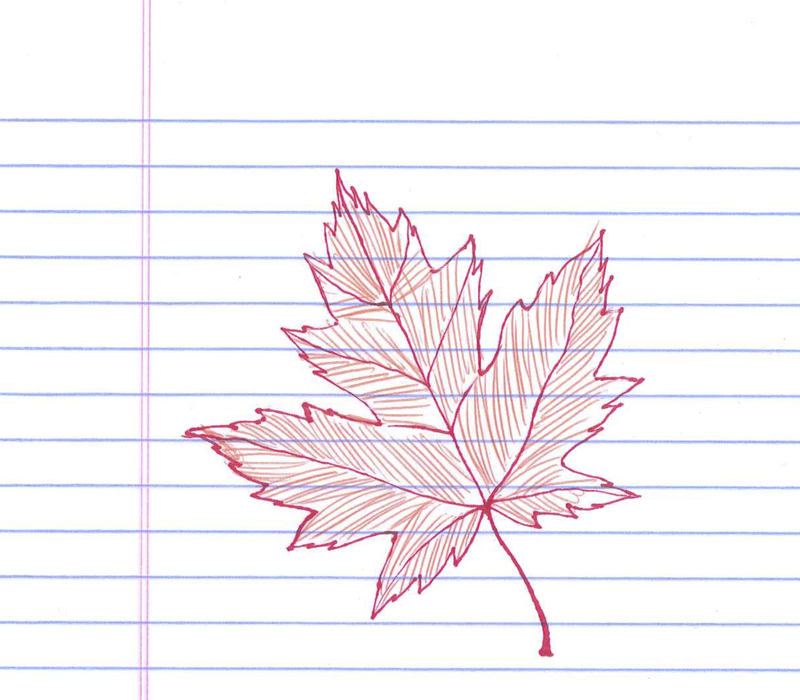 The maple tree may be named for its own spotted wood, making the very word maple possibly related to measles. The evidence for these sorts of matters can be quite spotty, but some kind of “spot” or “blemish” seems to be ultimately behind measles. The pronunciation and spelling of measles appears to have been influenced by mesel, an etymologically unrelated word used of leprosy. All things considered, the measles are quite rare in many places today compared to past epidemics, which can conceal the fact that measles is responsible for the word measly. The OED dates this adjective for “inferior,” “paltry,” or “stingy” back to 1847, and its usage may be in part due to associations with the word miserly or miserable, as well as a pig disease also named measles and the leprous mesel we just encountered. Curiously, a great many of the documented epidemics of measles affected the original Thirteen Colonies that broke free from Great Britain. Now, the measles outbreak has spread a rather feverish controversy over, among other matters, the right not to vaccinate, which really puts the red in the red, white, and blue. Hard hits, deep throws, gutsy calls–no, these words aren’t describing the New England Patriots besting of the Seattle Seahawks in Super Bowl XLIX, but the competitive sport of etymology. 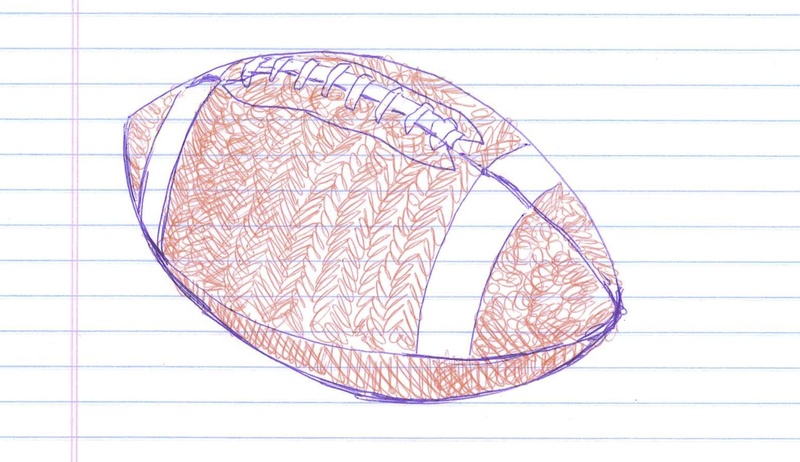 OK, not quite: the fields of American football and English etymology are many, many yards apart, but both keep fans tuning in with the surprises they offer game after game or word after word. Which is true for hawk and patriot. “Hawk & Patriot.” Doodle by @andrescalo. All hawks consider themselves patriots, but not all patriots consider themselves hawks. Riddle by me. A seahawk is a simple compound of sea and hawk, cited as such in the 1850s. Hawk itself is much older, evidenced as far back as 700, but you might not recognize it. In Old English, the bird was a hafoc, among other forms. During the period of Middle English, the f left hawk‘s nest, and its range of pronunciations and spellings gradually settled into its modern form of hawk. Hawks are incredible birds, soaring high, fixing their sharp sight on their prey, and diving down to seize it. And it is this seizing that ultimately gives the bird its name. Behind hawk is the Proto-Germanic *habukaz, exhibiting a classic Grimm’s Law shift from the Proto-Indo-European *kap, ” to grasp.” In Latin, this root yielded capere, “to seize.” Capable, capture, conceive, participate, prince, municipal, and (game-winning) interception are just a few of the many descendants of this prolific root. From the Germanic branches of this root English derives everyday words like have, behave, and heavy. That’s heavy. An incredible word hatched from an incredible nest. A person who claims to be disinterestedly or self-sacrificingly devoted to his or her country, but whose actions or intentions are considered to be detrimental or hypocritical; a false or feigned patriot. Behind πατρίς and πατρίa is the Greek πατήρ, “father,” from one of the Proto-Indo-European words for “father,” *pəter- (or *phter-). For all the divisions that warring fatherlands have caused, at least the root is etymologically unifying, for *pəter- gives Sanskrit pitṛ, Greek πατήρ which we just encountered, the Old Irish athir, and English’s very own father, among its other Indo-European progeny.